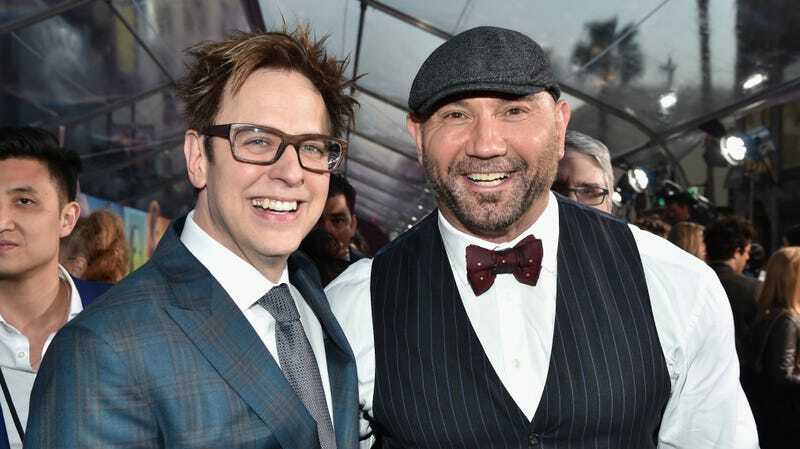 Few things in life are as pure as Dave Bautista’s devotion to his Guardians Of The Galaxy director James Gunn. Earlier this year, a gaggle of bad-faith trolls got him fired from Guardians Of The Galaxy Vol. 3 over a series of old, offensive posts he made on Twitter, and Bautista, who plays Drax in the series, emerged as his staunchest defender. He’s rallied for Disney to use Gunn’s script for the third movie, but has also said he might quit even if they do use it. “To be honest with you, I don’t know if I want to work for Disney,” he said in a recent interview. Well, his opportunity to jump ship has arrived. Yesterday, Warner Bros. announced that Gunn will be writing (and maybe directing) its upcoming sequel to Suicide Squad, and Bautista wants in. “Where do I sign up!” he wrote on Twitter when sharing news of the announcement. Gunn’s Suicide Squad will be an entirely new take on the material—thank god—and not a direct sequel to the 2016 original, so it’s very likely he could find a place for Bautista in the ensemble. If that happens, it would certainly complicate the former WWE star’s relationship with the Marvel universe, which has already been thrown a loop with the third Guardians film being put on hold.